First line: "Lia Kahn is dead. I am Lia Kahn." Teenager Lia Kahn leads a charmed life until a car accident robs her of everything, including her body. Her wealthy and pushy father has her memories downloaded into an android body. Lia is horrified at she's been turned into but still makes an effort to try and adjust. Wasserman mines a lot of ethics questions here including what makes us really human, our bodies or our memories? While Lia is coping with her own overwhelming feelings over the accident and adjusting to her new body, there are also a lot of sibling rivalry issues. Her younger sister Zoie, who should have been in the car that day, has spent her whole life being overshadowed by Lia, who has always been daddy's favorite and a bit of a Queen Bee. It's finally Zoie's turn to shine at school as Lia is shunned as freak; Zoie even goes so far as to steal Lia's old boyfriend. Talk about a shocking betrayal! Having her life turned upside-down in this way really changes Lia - and makes her parents wonder if she really is their daughter anymore, or just a close simulacrum of her. Her brusque and demanding father practically admits that he regrets pushing for the procedure. He thought he was saving his daughter, not dooming himself to having to live with a robot who reminds him of what he lost. Ouch! In the meantime, Lia meets a group of underground rebels who are campaigning for mechs' rights. They're a desperate and sad group, taking wild risks just to prove that they can and are angry that doctors won't "upgrade" them with vision or hearing that outperforms human standards. There's just a hint of a love triangle. When things don't work out with Lia's odious ex-boyfriend Walker, she finds new friends: nerdy technology-loving human Auden and intense skinner Jude. With her new circle of friends, she may not be the old Lia Kahn, but she reasons that she's still a sentient being with hopes and dreams for the future. Just as Lia is just starting to pull herself together, the book ends on a shocking cliffhanger. Not realizing her own strength, she seriously injures her friend Auden in an accident. Will he recover or die? Or will he become like Lia? 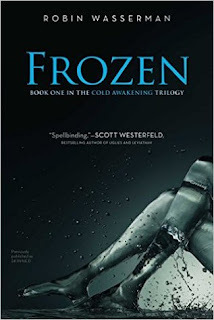 Frozen is the first book in the Cold Awakening trilogy and was originally released under the title, Skinned. Great review. After reading this I'm thinking of buying this book & give it a try. Can you please do a book review on Superwoman aka Lily Singh's book 'How to be a bawse'. That would be great. Thankyou.